On December 4, 2009, Sri Ramanujamji, at the residence of Smt. Priya Balasubramanian and Sri Murali at Sammamish, WA, had a session of introspection. This interactive session Sanathana Dharma and its relevance on all facets of life turned out to be an eye-opening session for all present. The attendees were so engrossed in the session that they came up with questions and thoughts despite the clock striking 11:30pm. Sri Ramanujamji’s insights and perspective were a truly thought provoking experience for all. 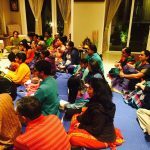 The program was welcomed by each one so much that there was one more introspection event at the residence of Smt Vaishnavi and Sri Muthu, Kirkland, WA in the evening of December 8, 2009. 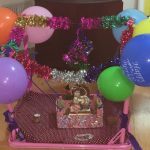 The concept of Maya, True Happiness, Ultimate Truth, the need for a Guru were discussed amidst various other topics and this time, Ramanujamji engaged the participants in a very lively conversation by questioning them and facilitating the talks. 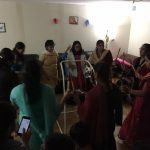 This was interwoven with Mahamantra chanting as well as a Bhajan session and the evening came to an end with the rendering of ‘Kaliyai Bali Kollum’ and dinner prasadam. Sunday Satsang on December 6, 2009, at the residence of Smt Shanti and Sri Dhilip, started off with our usual Mahamantra chanting followed by Shloka Recitations which included Vasudevashtakam, Guru Ashtakam and Thotakashtakam. Following this, the gopas and gopis of our Bala Gurukulam recited all the shlokas that had been taught to them including ‘Shlokas for Everyday’ and ‘Dhyana Shlokams from Srimad Bhagavatham’. The atmadharshanam segment of the satsang that week included a pravachanam by Ramanujamji on ‘Guru Mahimai’. Following this, the children of the Bala Gurukulam group led the audience into singing our Guruji’s kirtans and other Krishna kirtans and bhajans. People were listening and singing in rapt attention! The session concluded with Mahamantra chanting following which dinner prasadam was served for all Satsang attendees. Prabhodanam (waking up of the Lord) followed by the recital of Dhyana Slokas, Kunti stuti were conducted on all 7 days of the satsang from Decmber 3 – December 9, 2009. Dolotsavam (Puting the Lord to sleep) was also done on all 7 days. 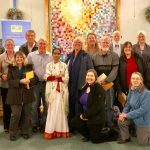 In addition to this, on December 4, 2009 all the ladies in the Seattle GOD Satsang came together to sing Bhajans, Kirtans and dance around the mesmerizing Krishna, resplendent with ‘vana maala’. It was a divine and joyous experience for each one.